Hey, that tastes good! : I can't stop eating these. I can't stop eating these. So obviously I'm busy working all the time and am not doing all the updating I should be. Since I'm busy working, I need quick things to eat that will keep me going throughout the day. I was sent a box of these a few weeks ago, and was a little skeptical. 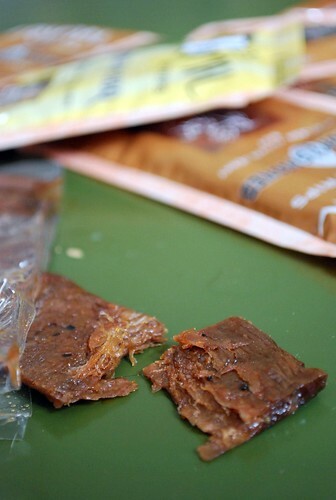 Vegan jerky? I like meat! These kind of things are yucky and chewy, as far as I know. At least I thought so. 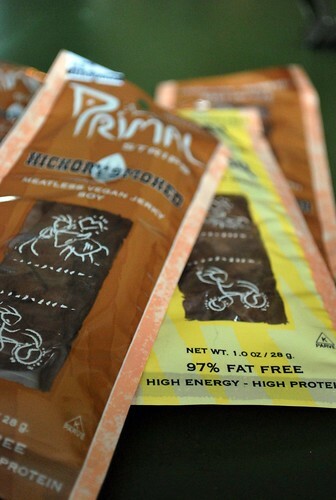 These little strips are delicious, high protein, low fat, and I can't stop eating these. Seriously. I ate all the ones the company sent me, and then went on a quest for more. They're sold at some Wholefoods, but I had to go to the one on the other side of the city to find them. Then I ate those. I picked up some more when I went to Amherst last week, and shot some pictures before I devour them. And the other thing, besides that they're vegan, gluten free (only the hickory smoked and texas bbq flavors), is that they're cheap. They cost $1.39 each, which is a good price for a delicious filling snack. Check them out. Vegan meat substitute that's cheap & delicious? Great find! Just found that they are avail north of the border! That does look/sound good! I was so upset w/ my husband this weekend for buying the only jerky in the store w/ gluten in it when I asked him to pick some up. I might just have to swing by the HFS to find some of this stuff! Interesting! I would normally shun something like this - I'm not much of a "pretend meat" eater. I like real meat. But if you say they're delicious, then I believe you! I might check them out when I'm at Whole Foods again! who would have thought? awesome! I got nervous for a second when I saw these on your blog -- I looked them over at my local health food store recently and saw gluten in the label. I must not have looked at all the flavors. So good to know! Now I CAN try them. woohoo! Bummer....the ingredients list @ amazon says both hickory smoked and texas BBQ have wheat listed in the soy sauce ingredients, and the others contain wheat gluten as the protein source. Are the ones you are picking up at WF saying something else? Hey, I saw these at my local health food store after reading about them here...and bought some...AND...they are surprisingly tasty! The texture is so jerky-like! These could come in handy in a food emergency. Thanks for the review.